RebKell's Junkie Boards :: View topic - The Shot...WCBB's Version! Which Shot Made The Bigger Upset? Which Shot Was A Bigger Upset? Spoon From Halfcourt Or Morgans Unthinkable Buzzer Beater? If there is any comparison how would you rank the 2? Spoon's shot didn't win the series. The Comets came out the next night and beat the Lib like nothing had happened. per Carol Ann, the "shot" happened in Richmond, Virginia, in 1994. 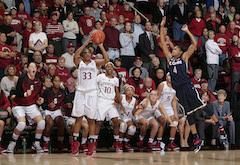 Charlotte Smith's perfect 3 to beat La Tech when the game seemed over. Will never forget watching that happen live. Everything else is nice, but that takes the cake as it was for the title for North Carolina. Capped off a great run by Sylvia and her tough, athletic Tar Heels. Too bad that shot never should've counted. Stephanie Lawerence clearly traveled on the inbound pass. I can't believe that gets overlooked so much. The UNC shot should not have counted ive thought that so many times but its still in the history books. 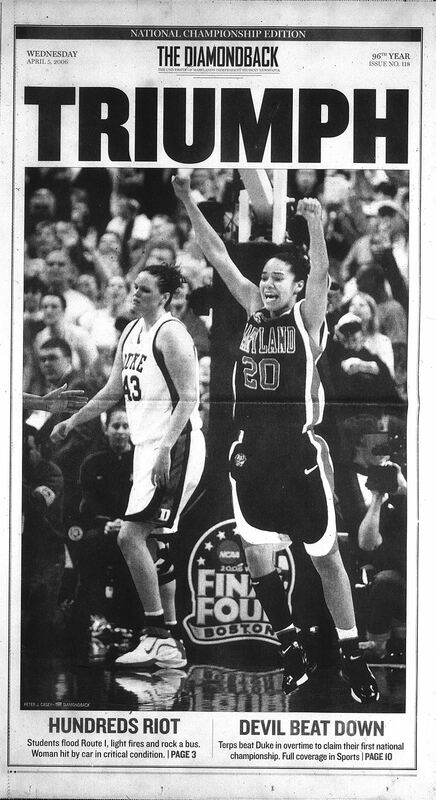 I voted Morgan's shot against UCONN only because of the dominance and confidence everyone had writing UCONN as the National champs before the tourney even began. I will never forget that moment for the rest of my life. I didn't like VIC and MSST before that game but i cant lie ill be rooting for them this year. I was there in person also. A Duke fan. The one and only time I cheered for UNC. As one steeped in the history of the game, I fully understood how big it was to topple Louisiana Tech. That is the biggest shot in wbb. All other shots are behind that one. Agreed, I was there too. LA Tech never won 111 games in a row , Thats what makes Morgans shot bigger in my opinion. Yeah, but it was the title game. Miss St didn't win the tournament. The team that won the tournament did not win 111 games in a row neither. Is Louisville upset of Baylor in 2013 the biggest upset ever? Amber Orrange is worth a mention. If we’re going by streaks as being the most important factor, Shenneika Smith’s shot against UConn handed UConn their first home loss against an unranked squad in 19 years and snapped a 99-game home winning streak. That would take the cake over Morgan’s. I agree with the others that some of the bigger shots in history are the title game shots. Neither one of those UCONN squads won the pinnacle 111 in a row still......it got to the point where people where predicting 200 before that shot went down. Yes but that streak had a lot to do with Stewart. My personal favorite is 1997 Tennessee upset UConn. Tennessee had lost ten games UConn was unbeaten. They still won 111 in a row something that most likely wont ever be done again. National Championship did not have the same prestige with uconn winning every year by a mile these last 7 or 8 years until that shot brought back hope! It was the only game I've ever seen where a team that was behind during the entire 40 minute game clock ended up winning. Duke was behind by two when Foley put up her 3pt shot, the horn sounded when her shot was in the air, but it went in and counted. UConn never wore the new metallic silver uniforms it debuted in that game ever again. Wow yes the metallic uni's for UCONN were cool . Never saw them again after that either lol. AB Vs DT was a great battle , Duke did not come to play until the last 5 minutes! Buzzer Beater by the Aussie Was classic , sad you cant find any footage of that shot anywhere anymore.